Objective: In order to provide a constant supply and boost skilled workers in a labour-intensive textile sector. This pilot scheme was introduced by the Ministry of Textiles in the last two years of 11th Five Year Plan. This scheme's first phase was first estimated during the 12th five-year plan with a budget of Rs 1900 crore was allocated to train 15 lakh individuals. The first phase pilot project costs Rs 272 crore out of which a contribution of Rs 229 crores by a government with a target to encourage and provide skills training to 16 lakh persons. This scheme approaches the gap of skilled manpower in textile sector by sector oriented training schedules. This scheme is implemented by three components where a high punch is given to public-private partnership mode. A partnership with a foreign company will give the latest training, demand driven technology to develop the textile sector. Till date, under this scheme, a target is to provide training to 10.84 lakh people will get training and out of which 10.12 lakh have been appraised and 8.05 lakhs have been placed. This skill development programme will cover the whole value string of the textile industry which includes Spinning and Weaving in established Sector. 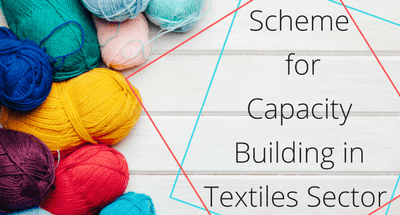 Scheme for Capacity Building in Textiles Sector will cost a budget of Rs 1300 crores for a period of 2017 to 2019. SCBTS will follow National Skill Qualification Framework with funding measures notified by the Ministry of Skill Development and Entrepreneurship (MSDE). The main aim of SCBTS is to give provide demand-driven, employment oriented skilling programme to motivate struggles in the sector to create jobs in a textile industry. It aims to upgrade skilled training in a traditional sector and to give subsistence by the ministry of textiles. The SCBTS will be implemented all over India and give benefits to all sections of society like Rural, urban, LWE affected, North East and Jammu & Kashmir. A preference will be given to all communities like SC, ST, differently abled, minorities and other vulnerable groups. In an XII five year plan, training was given to 10 lakh people and out of which 1 lakh are from traditional sector. Job training is based on the gap defined in skill at different levels like courses related to entry-level, courses related to Up-skilling or re-skilling, Recognition of Prior Learning and Entrepreneurship Development training. Section wise requirement of skill needs to be revised from time to time by consulting with a sector. In an era of digitalization, a web-based monitoring system is approved to steer each phase of the implementation of the scheme. Skill necessity in traditional sectors like handlooms, handicrafts, jute, silk etc. is considered to be special plans. Skill up gradation is strengthened further by providing MUDRA loans under entrepreneurial development programme. To measure progress and consequences, trainees will be appraised and a certificate is given by an accredited Assessment Agency. At least 70% of the certified trainees are to be taken into wage employment and post placement tracking is compulsory. To support women employment in the textile sector, all institutes are required to follow the guidelines and must protect from Sexual Harassment.